One of those days where I seem to almost eat breakfast and lunch at the same time. Purely because it is so impossible to get parking at the bowling alley. I think we have definitely decided to change for the next season and go to Elmira (where we bowled last Thursday) although further away, it won't actually take much more time because of Expressways leading in that direction and they have a huge parking lot. Not only that, they have a bit of competition between the teams, nothing major, but enough to spark one's interest to try harder which is what the present place really lacks. Tomorrow is April, seems unbelievable bearing in mind the weather. Although today it is raining and it hasn't been that cold for the last couple of days, but it sure doesn't seem very springlike. Once spring really starts though, it only seems to take a few days from no buds to fully leafed trees, it always surprises me every year. We have loads of American Robins about the place which is always a good sign and yesterday we had some Canadian Geese honking outside our window, when I looked out they were amongst the robins picking up all kinds of stuff from what bare grass they could find. There is more and more grass showing these days. I could swear I heard a Chickadee the other day too which is another good sign of spring, they must know something we don't as there is still a lot of snow everywhere. This is a recipe for White Chili which I got from World Wide Recipes.com some years ago, I have made it a few times and think it is good - it isn't very spicy though if that is what you are looking for. Comments: Serves 4 (hungry) or 6 (mildly hungry) people. OK to freeze leftovers to serve later. In a 4 1/2 quart (or larger) saucepan, cook onion in butter until soft, add bouillon, beans, water and chilies. Simmer till heated through (and bouillon cubes are dissolved if using cubes) - about 10 minutes, stirring occasionally. Then stir in cayenne pepper, cilantro, cumin and chicken and simmer again to let flavors mingle and everything is heated through. Serve with shredded Monterey Jack cheese on top. From what I read on the internet, Earth Hour seems to have been fairly successful last night. Our lights were, of course, off, because we were out, but our host and hostess turned out their lights, even the fish tank and lit candles. We sat there eating our cheese course in candlelight, very pleasant. Our hostess went out for a drive with her son and found a lot of lights in the area were out but although MacDonald's had turned out some of their lights, Tim Horton's (a Canadian coffee and donut chain) had not. The street lights didn't go out either although Burlington, which is where we were, had committed to Earth Hour. Canada was, however, one of the biggest participants so three cheers for us. I read that in Alberta the cafes and bars did not turn off their lights as there was a big hockey match taking place - much more important to make money than to do anything for conservation. On the left you will see two photos taken in Toronto before and after the lights went out. They were taken from the CN Tower which also went dark. We had a very enjoyable evening with our friends and an excellent dinner. Our main course was beef steak done on the barbecue, the cut was a beef tri tip which didn't register with me or my friends, but a very good piece of meat and beautifully cooked. I have just found this article about the cut, I must see if there is anywhere I can buy it locally. With it we had a salad which had an Egyptian dressing of olive oil, lemon and mint. The dressing had been made up specially for our hostess by a restaurateur. We also had baked buttered asparagus, baked mushrooms in garlic and butter, mashed potatoes, a relish tray, in fact a stack of food. Having eaten all of that, we turned out the lights and ate Brie, Havarti and other cheeses with assorted crackers. Matt went nutty on a rosemary flavoured cracker and has brought the packet home to see if he can find them. If not I will have to nag my friend in to buying me some. Our host is Romanian and last night he introduced me to the Romanian plum brandy which is called Tuica. His mother had brought him some when she came to visit. I was enjoying it, maybe a little too much. Matt couldn't try it because he was driving. The Tuica we were drinking was virtually colourless and we certainly didn't drink it in such large quantities as shown in the picture. Apparently a lot of Romanians distill their own Tuica although the government has cracked down on this somewhat I'm told. We also drank some wine, starting with a Barefoot Shiraz which was one Matt bought and we hadn't tried before which I enjoyed, but Matt thought wasn't full bodied enough. We didn't leave there til pretty late and got home around 2 a.m.
Another recipe I got from a friend and don't know the source. Sounds pretty good though. Season pork with salt and pepper. Heat oil in heavy large skillet over medium‑high heat. Add pork; sauté until brown and just cooked through, about 5 minutes per side. Transfer pork to plate; tent with foil to keep warm. Add onion and fennel seeds to same skillet and sauté until onion is tender, about 5 minutes. Mix in paprika; stir 15 seconds. Add wine, broth and lemon juice and boil until sauce thickens slightly, scraping up browned bits, about 5 minutes. Season sauce to taste with salt and pepper. Spoon sauce over pork chops and serve. Apparently pork is one of the most widely eaten meats in Romania I was told last night. I do hope you will remember to do this tonight, of course in Australia the time has passed. I saw a picture of the Sydney Opera House without lights, but it looked as though there were still hundreds of lights on in Sydney itself. This morning I had three separate reminder emails from the World Wildlife Fund, different departments. One thing I was disappointed about, my personal WWF Earth Hour site was taken down by yesterday and I had one more friend who wanted to sign up. I shall draw this to their attention. I did manage to persuade 17 of my friends to sign up on my site, well 18 to take part. I hope more friends will do so when they see the news coverage today. One thing WWF slipped up on they were describing 10 things you can do during that hour and one was something about relaxing, taking time for yourself and reading, in the dark? As I mentioned, we will be at a friend's house this evening and will presumably have finished dinner, so we will just talk ourselves silly during the hour. Canada is supposed to have signed on to this wholeheartedly which makes me proud of my country. However, bad news this morning, protection has apparently been removed from the Grey Wolf in the Northern Rockies as of a few hours ago. There are now entries on Google about planned wolf hunts which is a horrible thought. Here's a short article about it read here which says they are going to hunt them because of their predations on livestock, my reaction is move your cows, but I know that is unrealistic. I am not a vegetarian, but I cannot justify in my mind killing an animal because its in your way. I have trouble with hunting anything - we aren't dependent on hunting for food any more. I am afraid I am a bit hypocritical about the whole thing as I understand the way animals are bred for the table is pretty horrendous. This is, of course, a very big topic and one I am not going to address. Just don't hunt wolves please. Wash the leeks and discard the green parts. Slice the white stems lengthwise into narrow strips about 2 inches long. Place in a saucepan with 1 oz of the butter, a pinch of salt and 8 tbs of water. Cover and simmer for 20 mins. Keep hot. In another pan melt the rest of the butter and gently cook the shallots until they are very soft. Add the wine & vermouth. Bring just to the boiling point, add the scallops then turn the heat very low and simmer for a minute until scallops just firm. Do not overcook. Remove the leeks from their liquid using a slotted spoon and place in a heated dish. Using the same spoon place the scallops on top. Add the leek juice to the scallop juice and boil until the liquid is reduced to 8 tbs. Pour in the cream, return to the boil and bubble for a moment or two. Season, pour over scallops and scatter with parsley. They never worried about calories, diets, fat content or anything else, but this is a delicious recipe. I was so sad when Jennifer, the one with the glasses, died. I understand Clarissa runs a book store these days. Wikipedia has an interesting article about the pair of them. Yesterday, as I told you, we were bowling with our Travel League. This month we were visiting Elmira Bowl which is about half an hour out of town for us. I had forgotten until we passed through St. Jacobs and the surrounding countryside towards Elmira, how large a Mennonite community there is in this area. Yesterday we saw several Mennonite buggies driving around, a couple of which were open and must have been damned chilly even yesterday which was pretty sunny. The Crossroads restaurant I mentioned where we had lunch is run by this community so all the girls are wearing their traditional clothes and bonnets - I always admire the women's dresses, they are beautifully made and simple in design but quite elegant. 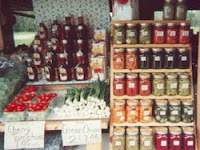 St. Jacobs is famous for its market and of course a lot of it is run by the Mennonites who own many of the farms in the area. They are a religious group and have their own doctrines. They basically don't believe in modern technology and therefore use horses for ploughing and pulling their buggies and so on. I don't know about the level of technology in their homes, but TV is out and they are a much better community for it. However, some of the younger Mennonites are breaking away from tradition and do drive cars these days and take part in more modern activities. I have never been fortunate enough to make friends with any of the families, but from casual interactions they always seem to be very nice and cheerful. Not to mention hard working, kind and caring. 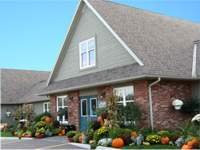 St. Jacobs is also home to two small theatres, the Country Playhouse and the Schoolhouse Theatre. There is a group known as Drayton Entertainment who stage plays all round southern Ontario and we usually try and see some of their shows. I am booked to see four of them this summer and am looking forward to it. The first time we went was for my birthday a few years ago and we saw Joseph and His Technicoloured Dream Coat which we hadn't seen anywhere before. It was beautifully done and we thoroughly enjoyed it. We went for dinner at Benjamin's in St. Jacobs before the show and then drove to Drayton itself to their Festival Theatre which is a fair distance away. A couple of years ago, I went with a friend to the Huron County Theatre to see the Mikado, that theatre is in Grand Bend which is a couple of hours' (or more) drive away, we went to the matinée and arrived in time to have a picnic in the sunshine in front of the theatre, it was a great day and the production would not have shamed d'Oyle Carte in London who specialise in Gilbert and Sullivan productions. The Mikado arrived on stage by being driven in a golf cart right through the audience. Pretty funny. Matt is not going to any of the shows this year as there is nothing he particularly wants to see, so I am going with friends. I also plan to go to the pantomime in St. Jacobs this Christmas. We went to see their Alladin which was based on the wonderful British Pantos; this year they are doing Cinderella. Great fun and great theatre. Traditionally there is always a pantomime dame who is played by a man. In England dames have been played by some very famous comedians. One of whom was John Inman of Are You Being Served fame. I bet he was good, I would have liked to see him. Here's a nice hearty meal, I got this from a friend in England, but I don't know where he got it from although from the measurements it must have been from North America. Blend together the flour, salt, pepper, and paprika, in a large bowl. Roll the meat cubes in this mixture until they are well coated. Melt the butter in a large saucepan. Add the onions, and Sauté over medium heat until they are softened and tender. Be careful not to brown the onions. Remove the onions from the pan with a perforated spoon, pressing out as much fat as possible. Place the same pan over high heat and sear the cubes of meat, a few at a time. This operation will give color to the finished Carbonnade. Return the onions and meat to the pan, and set it over low heat. Add the seasonings, brown sugar and beer. Bring to a simmer, while stirring. Simmer over low heat until the meat is tender, about 1 1/2 hours. Add the 1 tablespoon vinegar. Simmer for 5 minutes. Serve with a dish of boiled potatoes and a beet salad or pickled beets. As I told you today, we are going to lunch with bowling friends and then on to a bowling alley in Elmira which is a few miles away. So I haven't a lot of time this morning. I will just leave you with a recipe and talk to you some more tomorrow. I just love artichokes so hope you will enjoy this pesto. Note: I have never actually seen frozen artichoke hearts but we have canned (tinned) ones here, make sure you don't get the pickled ones though. Would you believe we got another couple of inches of the white stuff yesterday, its supposed to be Spring for goodness sake, we have had enough. Spring here tends to happen almost overnight though, one minute there is not a bud in sight and the next the trees are in full leaf. Not a lot will happen til the snow has gone I don't suppose. I am presently reading The Dark Materials Trilogy, from which the movie Golden Compass was adapted. Its good, but in some places, very slow going. The concept is certainly fascinating. I am beginning to understand the protests against the story from religious groups, but it is only a story after all. I got very irritated when people took The Da Vinci Code literally, can't readers differentiate between fact and fiction? I wasn't, personally, very impressed with that book, couldn't see what all the fuss was about. It takes all kinds, just as well we don't enjoy the same books or they would never get read. Some authors seem to get an idea and then appear to strain to get that idea across which makes the story less appealing. A classic case in point is the Cave Bear series by Jean M. Auel. Her first book The Clan of the Cave Bear was absolutely brilliant and really worth reading. Her subsequent books have contained flashes of the original brilliance interspersed with boring repetitions of descriptions she wrote in her first book. She told us what the grasslands were like in book one, also about stone knapping tools and so on, but these things are repeated endlessly in subsequent novels, unnecessary. She is taking forever to produce the later books, whether she is suffering from the proverbial writer's block I don't know, but there are years between her recent books. I think writing a trilogy is great, then start something new, don't go on book after book with the same old story. Robert Jordan is another who is doing this in his Winds of Change series. Originally it was supposed to be seven books but I think we are up to nine now. He is not a well man these days so whether he will ever finish these stories, is anyone's guess. From reading the blogs of several writers lately, I understand there is a lot of angst in writing a story - I couldn't do it myself I know, so maybe I am being super critical. I have a friend who has written an excellent book, I have read it, but hasn't managed to get it published. A pity. On an uncritical note this curry is one of those I haven't made, but think sounds so good that I saved to do at some time in the future. I love tomatoes in any shape or form anyway, so I think this will be delicious. To get good tomatoes you may need to wait for the summer, depending where you live. Peel the onions and chop them roughly, then let them cook slowly in the groundnut oil over a low to moderate heat. Peel the garlic, slice it thinly and add it to the onions. Chop the chilli finely, then add it, with its seeds, to the onions. Stir in the mustard seeds, turmeric and cumin seeds and continue cooking. Peel the ginger and cut it into matchstick-sized shreds. Add it to the pan and let it cook briefly, then add the tinned tomatoes, 400ml of water and a grinding of black pepper and salt. Turn up the heat and bring to the boil, then add the whole tomatoes. Turn the heat down to a gentle simmer and leave to cook, covered with a lid, for twenty-five to thirty-five minutes, turning the tomatoes once or twice during cooking. You want them to soften but not totally collapse. Add a little more water should the mixture thicken too quickly. Push the tomatoes to one side, then stir in the yoghurt. Let the sauce heat through, stirring gently, but without letting it come to the boil. Serve with rice or warm naan. As a kind of PS, I don't know what it is about my blogs which attracts enema cleaning ads, very odd I think. On Good Morning America today there was a very interesting article by an author and explorer on extending one's life. There is apparently another programme later in the week about the same thing. He was talking about all the different areas of the world where they do have long life spans and why this appears to be so. If you are interested click here to read a synopsis of the article. He calls the areas where people live longer "Blue Zones" and there is, of course, a book to go with it. One of the Zones is Okinawa, Japan, where this picture was taken. They live longer because it is important to them to have a sense of purpose. It doesn't necessarily include a whole country or area, Loma Linda, California, is a Blue Zone and yet it doesn't apply to California in general. I found it all pretty interesting and worth taking a look at. I will try and take in the programme later in the week. The difficulty is, when one gets older, so do all one's friends and we spend forever talking about health problems which really are self absorbing although not of such great interest to others. We have younger friends too who are beginning to get into the aches and pains part of life, distressing really. I suppose we shouldn't focus on them. There are at least a couple of women I have met bowling lately who are 94 and 82 and seem to be in the prime of life. The 94 yr. old, I am told by her daughters, bowls twice a week, goes line dancing and plays table tennis. Not sure I could cope with that at my age let alone 94. 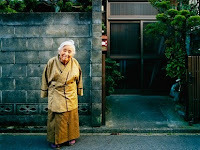 She is a tiny little woman too and yet fit, healthy and vibrantly alive. So if you are young and fit, beware of losing that healthiness and do everything you can to combat it, this does not necessarily include hours in the gym each week. Short and frequent exercising is better than a long session in the gym apparently. Less sitting on the couch watching TV, or in front of a computer (guilty). Oops, I have just discovered pressing return in the wrong spot publishes one's blog. Will have to be careful. On Thursday we are going on our Travel League Bowling, this is when members from different bowling alleys get together once a month at a different alley each time - we will be meeting a bunch of friends at The Crossroads restaurant for lunch before we bowl. We have been there once before for lunch although the others have been several times. If you'd like to read about the restaurant click here and you can see their menus and buffet offerings. It is all homestyle food and their home made baking is pretty well known in the area. Friday I go for a refresher at Let It Heal which will be great. More and more people are going there on my recommendation. If you have pain, go for Bowen Treatment, I can highly recommend it. The following recipe is one we have enjoyed several times over the years, so I am sharing it with you now. 1 Cook macaroni in boiling water for about 10 mins until tender. Drain and rinse under cold water, set aside. 2 Line each shell with basil leaf. Mix remaining ingredients and spoon evenly into shells. The Australian bloggers have all been at a conference in Perth called Swancon and it looks like they had a fabulous time, Glenda Larke has been posting lots of pictures in her blog. Interesting, because it shows some of the authors of the blogs or books I read and puts a face to the person behind the writing. We were supposed to get more snow again last night but luckily didn't although apparently Buffalo got some. The lake effect I was talking about a few weeks ago. Easter Sunday was delightfully sunny but very cold. Didn't go anywhere, just relaxed. Today, of course, is Five Pin bowling and none of my team will be there so I will be plonked onto another team! I wonder how that will work. They don't have any kind of competition between the teams so it doesn't really make a difference where you bowl or with whom. If any of you have signed up for Earth Hour, don't forget, its next Saturday, March 29, between 8 and 9 p.m. If you haven't signed up please do so at my site and join in. Its only for one small hour out of your life and well worth doing. We are going to friend's for dinner and plan to have dinner over by then and to have our Earth Hour after. Cook rice with a couple of cloves, some peppercorns and some crushed cardamoms. Boil eggs for 4-5 minutes, shell and slice, remove yolks. Put chutney and curry paste and 2-3 tbsps of water per person in a pan and boil, then simmer for 5 mins. Add mango if using (if not, add an extra tsp mango chutney to sauce) and fresh coriander. Mix fish with rice and heat through, add sauce and egg whites, sieve yolks over top and serve. I like kedgeree for breakfast, but it can be eaten for any meal you choose. I am exhausted already, I have just washed up enough dishes to stun a restaurant. Well that's what it seems like. Unfortunately, much as I love our apartment, one thing we do not have is a dishwasher and there is no room for one either. No it wasn't really as bad as the picture, just felt like it. However, dinner went well, the Arugula Salad with Beans and Shrimp was good although I was disappointed in the arugula. I thought it was supposed to have a distinctive taste, but all three of us decided it didn't taste of much at all. Funnily enough not one of us had tried it before. In case you are wondering, it is known as rocket in the UK. The recipe does suggest other types of salad greens including Romaine, so if I make this salad again, that is what I shall be using. The lamb turned out beautifully and so did Matt's roast potatoes. As for the Brie de Meaux, it was just right and delicious. Matt picked up a French batard in the morning and we ate just the bread and cheese which was delicious, we accompanied it with a glass of port although Matt preferred his Shiraz with the cheese. We have quite a few leftovers so we will be having those for supper tonight. I think there is enough lamb left for a couple of suppers unless I turn it into a shepherd's pie. Talking of which, our visitor last night, who was born and bred in the UK didn't know that a Shepherd's Pie must have lamb, otherwise it is a Cottage Pie. This is a common mistake in North America where lamb is not a favourite meat anyway. Having said all that, this is a recipe we have used a few times and thoroughly enjoyed, even if, technically, it is mis-named. Preheat oven to 375 F. Cook potato and drain. Add buttermilk, butter and 1/4 tsp each salt and pepper. Beat until creamed. Cook meat in a large nonstick skillet over med heat until browned, stirring to crumble; drain. Return to pan. Add remaining condiments, onion, celery, fennel and garlic. Cook over med heat 5 mins or until veg are crisp tender, stirring frequently. Add salsa; simmer over med low for 10 mins. Spoon into 8 " square baking dish, coated with spray. Spread potato over meat. Sprinkle with cheese. Bake uncovered for 20 mins or until thoroughly heated. One thing I forgot to mention, I got my Lindt gold bunny from Matt. Have a great day. I was just reading French Marilyn's blog about pawning wine in France. See her blog on this page. I must say, I see no point in owning wine you can't drink, surely that's what its for. Wines that are valued at $23,000 a bottle may be a great investment, but isn't wine originally intended for consumption and enjoyment? This is a photo of the Chateu where Chateu d'Yquem is produced, one of the most expensive wines in the world. I remember many years ago my parents met Count Chandon of Moët et Chandon who's yacht happened to be moored alongside theirs, I think it was in Malta, but am not sure. Anyway, they got on very well together and he gave them two bottles of their top champagne, Dom Perignon and a case of red wine, not sure what make it was I always assumed it was from his own estates, but I don't know for sure. My mother saved one bottle of Dom Perignon for me when I visited and we opened it for my birthday, I was terribly disappointed. I love champagne, but I guess I have cultivated a taste for the cheaper, more available, stuff and just didn't enjoy the Dom Perignon one bit. 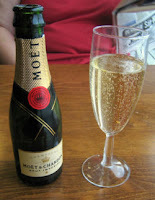 I do like their Moët et Chandon Cordon Rouge champagnes though which are somewhat cheaper. However, the red wine was fantastic, one of the best reds I have ever drunk. I just wish I knew what it was. The picture on the right shows a small bottle of champagne. I used to keep those at home all the time, many years ago, I remember us having the devil of a time trying to open one of the bottles. However, a glass of champagne at 11 in the morning is a very civilised way of living, in my opinion of course. Here we keep three packs of Henkell Trocken Fine Sekt sparkling wine (not allowed to call them champagne unless they are vinted in the Champagne area of France). These are just the size of one champagne flute and so are ideal for me. A tip, by the way, if you open a large bottle of champagne and don't finish it, you can keep it sparkling for a couple of days by putting a silver spoon, handle down, into the neck and putting the bottle in the fridge. Works a treat. I've talked about Canadian wines before and I found that Hillebrand make a very good sparkling wine, their Trius Brut which is not inexpensive, but worth the price for a special occasion. Their sister winery, Peller, make a sweeter sparkling wine called Crystalle which is a delightful wine, but generally a little too sweet for our tastes, not that Matt really likes champagne anyway. About the only way he will drink it is in a champagne cocktail. Don't drink too many of these, they are pretty lethal. We used to serve these regularly on Christmas morning and once in NC our next door neighbour had to crawl up his steps to get home, he swore we had doctored his drink, we hadn't. There is a fairly local restaurant which does Sunday brunches and usually has a champagne cocktail special. They seem to choose, maybe, an orange flavoured liqueur, top it up with champagne and add some mandarin slices, I have drunk Kir Royale there too which is Cassis and champagne. Kir being a classic drink in France, but made with white wine and Cassis. We have only been to the restaurant once for brunch since we came back as I don't enjoy their brunches as I used to, the whole point, to me, is to have both breakfast foods and lunch foods and they were no longer serving bacon, eggs and other breakfast dishes. Don't get me wrong, it was excellent food, just not really brunch to me any more. When I first started drinking champagne, it was always served in a cup or bowl shaped glass similar to those on the left. Legend has it that these bowl shapes were designed to emulate the shape of Marie Antoinette's breast. That is the French queen who was guillotined. Well, now I have to go make preparations for my Easter dinner tonight, my leg of lamb is so big its going to need a couple of hours to cook. I cheated by having a savoury of Brie de Meaux instead of a dessert, so I don't have to worry about that part. It is warming up nicely on the counter top. Matt is going to the store to get a baguette and then we shall be all set. Have a great day and a Happy Easter. In England it used to be traditional to eat Hot Cross Buns for breakfast on Good Friday, I always loved them, dripping with butter. I was going to make some for today, but forgot to buy yeast. For some reason the ones you can buy here don't taste the same. Its probably just as well I forgot to get yeast, as someone has already pointed out, think of the calories I have saved. I have never taken part in any traditional Easter Sunday events, but Matt was telling me how, as a kid, they were given coloured hard boiled eggs and they took them to a local small zoo where they rolled them down a hill. They then rolled down the hill after the eggs and got filthy and thoroughly enjoyed themselves. When we were kids, we didn't have the Easter Bunny in England, although I believe they do now. Of course, when we were kids, we didn't get chocolate Easter eggs either because there was a world war on. The first egg I was ever given was just a plain chocolate egg covered in coloured tin foil. Not very interesting but exciting to me as it was the first I had ever seen, or eaten. In later years we could get the prettiest eggs, beautifully decorated and frequently filled with chocolates or other candies. Unfortunately I missed out a lot as I was always on a damned diet after about age 11. In North America I have never seen eggs like we used to have in the UK, you can buy all kinds of chocolate animals, bunnies, elephants and this year I saw Pooh Bear which was a first for me. I love the Lindt gold bunnies, Matt bought me one last year and I was very good and only ate a little piece at a time. *g*. These are shown with a ribbon, but the ones we buy have a gold bell hanging round the neck. I have always wanted to try colouring eggs like the Russians do, I have a cookbook with detailed instructions on how to do it, but it looks rather complicated so I have never tried it. They are so attractive. It takes a lot of work to achieve these results. It is very much an art form. Heck, I have never even tried colouring an egg at all, I guess my mother never did it, or not that I remember, so it wasn't a tradition in my family. Last night, there was nothing interesting (to us) on TV so we decided to watch a VCR I taped years ago of the story Shogun by James Clavell. The book is one of my all time favourites and I have read it several times, each time I find something new. The VCR is a tad old now and not the greatest recording quality in the world, but we both enjoyed it. It was a mini series, so we have not finished watching and will probably do so tonight. Richard Chamberlain plays the lead character of Pilot Major Blackthorne. That character was based on a real life pilot from Chatham, Kent, England, where we used to live, his name was Will Adams and he landed Japan in the time of Queen Elizabeth I and lived in Japan for the rest of his life. There is a memorial to him in Chatham. The book itself, in my opinion, deserves the status of a classic of the Twentieth Century. I have enjoyed most of James Clavell's novels, but Shogun was by far and above the best. The second best, to me, was Tai Pan which took place in Hong Kong. Another great book. I thought of giving a recipe for Hot Cross Buns, but too late for this year. Assuming I am still blogging by Easter next year, I will include one. Instead, I will give you the chicken dish we ate last night, I think I may have included this recipe before, but it is both very good and very quick and easy to do, so worth repeating. 2 In a heavy 10 in skillet, heat the corn oil over mod high heat for 1 mins. Add the breasts and cook about 3 mins on each side, do not overcook. Transfer the breast to a heated platter. 3 Add the chicken broth to the skillet scraping up any browned bits on the bottom. Stir in the lemon juice and capers and heat through. Pour the sauce over the breasts and serve. Do try this, you will be surprised how easy it is to do, the most difficult part is pounding them. There has been a lot in the news lately about portion control. It is certainly something which isn't done very often in North America, all the fast food joints advertise bigger and better burgers and large sized cokes, etc. I must admit some of the ads one sees on TV make me feel sick there is so much stuff piled on one bun. But its not just fast food, a lot of ordinary restaurants do it too and I know at least one couple who aren't satisfied unless they can take a doggie bag home with them. Not everyone takes a doggie bag though, most of them eat what's there. Buffets are the worst, people pile their plates with food and then don't eat it all and still go back for more. They definitely consume way, way too much. As for High Days and Holidays, the tables are groaning with food and people eat and eat and eat. Yes, I am guilty of doing this too although I don't eat as much as I did. I think age decreases one's appetite. When you think that a portion of meat or fish should be the size of a pack of cards, then think what most people consume, it is no wonder so many are obese. I hate that word, but it is the medical description of anyone really overweight, morbidly obese is even worse. Something I have never understood is how anyone can wear a bikini when they are so overweight. My one visit to the Dominican Republic shook me as there were huge women wearing bikinis, I was about a third of the size of some of them and wouldn't have dreamt of wearing a bikini. Wearing a swim suit was bad enough. Having said all that by the way, I have now lost 13 lbs. which I am very pleased about. Mind you if I had kept off all the weight I have lost in my lifetime, I would be a Twiggy. Wasn't it Irma Bombeck who said something similar and that she could have ended up as a bracelet charm if she'd kept off all the weight. I do find using the Points Tracker on the Weight Watchers' site helps terrifically. I don't use anything else other than the weight tracker, none of the menus and so on. So often the menus contain foods I wouldn't eat anyway, or things I can eat a half of, what on earth do you do with the other half? Avocado springs to mind, Matt isn't keen on avocados and you certainly couldn't keep a half. I suppose guacamole would keep for a day, but then you have to add other things such as chips or crackers. Nope, no good. Yesterday I gave you a dessert recipe, so only eat a small piece if you make it and are on a diet, today, how about burritos. We've had these several times and they are very good. Preheat oven to 375F. In a heavy 10 in skillet heat the oil over moderate heat for 1 min. Add meat and cook, until no longer pink (unless using precooked meat) transfer meat to a bowl. Cook onion and garlic uncovered in same pan until soft. Blend in flour, chili powder and cumin and cook sitrring constantly for about 2 mins. Stir in chicken broth, buttermilk, chilies and tomato paste. Reduce the heat to low and simmer uncovered for 4 to 5 mins or until slightly thickened. Return meat and stir. Place a scant 1/4 C of the mixture on the lower third of each tortilla and roll it up like a cigar. Place seam side down in an ungreased baking plan and drizzle any remaining filling down the center. Bake uncovered for 5 mins. Yesterday we bought a largish piece of Brie de Meaux - I wrote about this a week or so ago. It should be at just the correct ripeness by Saturday. It really is the most delicious cheese if somewhat expensive. On Saturday we will purchase some French bread to eat with our cheese. I also bought myself a pot of Mascarpone. The genuine Italian stuff, not the cheese you can buy most any place which has some kind of bean gum in it. The bean gum is not only a preservative but acts as a sweetener. I like to eat Mascarpone on bread for lunch so do not want it sweet. Even if I were making a Tiramisu, I still would prefer to do my own sweetening. That applies to anything with pre-added flavours. I prefer to add my own seasonings whatever they may be rather than, for instance, buying a can of seasoned tomatoes or something similar. So if you want to avoid added flavour to your Mascarpone, make sure it doesn't contain any kind of bean gum preservative. It usually means you need to buy the cheese made in Italy, not that made in North America and of course you may have to pay more for it, but it's worth it. Whilst writing about things not to buy, never buy the stuff in supermarkets labelled cooking wine. It is apparently loaded with salt and tastes terrible. If you want to use wine, use something you would and can drink, not, I repeat not, cooking wine. If you don't want alcohol but would like the taste there are non alcoholic wines about these days which can be substituted. They used to say all the alcohol disappears during cooking, but I have recently heard that isn't exactly true. Here is an interesting article on cooking off alcohol. Sorry don't remember the source. place of Marsala wine. Cream cheese may be used in place of mascarpone cheese. Orange liqueur or orange juice may be used in place of brandy. Ladyfingers should be approx 4x1-inch size. Plain cookies or cake may be used in place of ladyfingers. 1. Make the filling by beating egg yolks with sugar until light. Beat in Marsala. Cook gently in a double boiler or in a stainless steel or glass bowl set over a pot of simmering water. Cook gently, stirring constantly, until thickened. Cool. 2. Beat mascarpone cheese until smooth and then slowly beat in cooled custard. 3. Whip cream until light. Gently fold into cheese mixture. Reserve. 4. Combine coffee with brandy. Reserve. 5. Line an 8-inch baking dish or trifle bowl with ladyfingers. (Do not worry if ladyfingers do not fit exactly, break up extras and fit into spaces.) Drizzle with half of the coffee mixture. Spread half the filling over. Sprinkle with half the chocolate. Repeat layers starting with ladyfingers, drizzling with remaining coffee, spreading remaining filling over ladyfingers and topping with chocolate. 6. Refrigerate a few hours or overnight before serving. Tiramisu can be frozen for up to one month. Ooooh, my mouth is watering.